This appendix presents data on the employment status and earnings of Hispanic and non-Hispanic workers at the end of 2006. 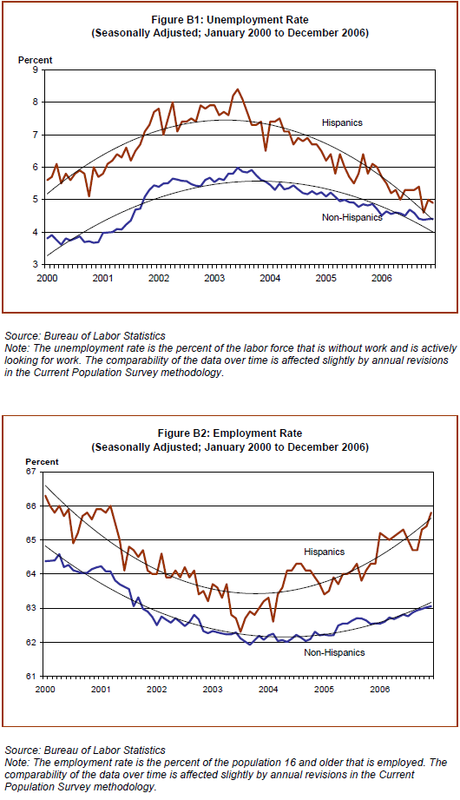 The unemployment rate for Hispanic workers in the fourth quarter of 2006 was 5% on a non-seasonally adjusted basis. That was nearly a percentage point less than the unemployment rate of 5.9% in the fourth quarter of 2005. The decrease in the Hispanic unemployment rate continued a trend that began in the middle of 2003. On a seasonally-adjusted basis, the gap between the Hispanic and non-Hispanic unemployment rates is now only 0.5 percentage points. The Latino labor force added 980,000 workers between the fourth quarters of 2005 and 2006. That accounted for 38% of all workers added to the U.S. labor force. Employment for Latinos increased by 1.1 million, rising 5.9% from the fourth quarter of 2005 to the fourth quarter of 2006. Latinos, who were 13.9% of the U.S. labor force, represented 36% of the total increase in employment. Foreign-born Latinos continued to account for most of the increase in the Latino labor force (825,000 out of 980,000) and employment (853,000 out of 1.1 million). The unemployment rate for foreign-born Latinos was 4.2% in the fourth quarter of 2006, compared with 5.9% for native-born Latinos in the same time period. For both groups of workers the unemployment rate at the end of 2006 was well below the level a year ago. The employment rate for Hispanics workers, or the percent of the working-age population that is employed, increased from 64.6% to 66.1% from the fourth quarter of 2005 to the fourth quarter of 2006. 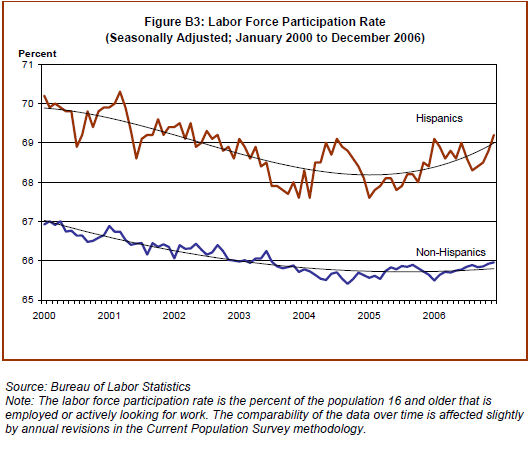 The labor force participation rate among Hispanics, or the percent of the working-age population that is either employed or actively seeking work, increased from 68.7% to 69.5% from the fourth quarter of 2005 to the fourth quarter of 2006. The median weekly earnings of Hispanic workers increased 2%, from $420 to $428, between 2005 and 2006. This rate of increase was higher than for other groups. 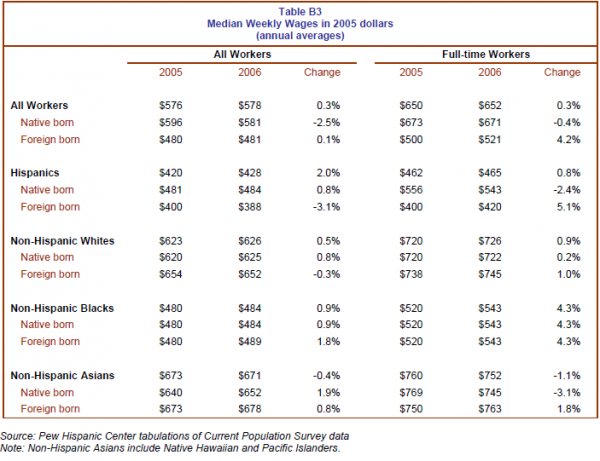 However, Hispanics still have the lowest median wage of any racial or ethnic group. The median weekly earnings of foreign-born Hispanic workers fell 3.1% in 2006, from $400 to $388.